We hope you've had a great year and have many things to be thankful for. Thursday is Thanksgiving here in the States, and we're taking a four-day weekend to travel, spend time with family, and maybe do some Christmas shopping. Maybe. So this week's 'Book Review is coming out on Wednesday - and it's been a slow news week. "The MacBook's switch to a Core 2 Duo processor may have produced only modest gains when compared to a similar upgrade to the MacBook Pro. But the updated MacBooks do beat their high-powered counterparts in one significant area - they run significantly cooler. "Testing by Macworld Lab found that the move from a Core Duo chip to a next-generation Core 2 Duo processor decreased the MacBook's external temperature by about 5 degrees, allowing you to actually set this laptop upon your lap. The chip swap produced similar results for the new line of MacBook Pros released in late October, but potential buyers may be more impressed by the new MacBooks' consistent peak temperatures of approximately 95 degrees Fahrenheit near the battery." "Given that there are three Core 2 Duo MacBook models with entry-level one being built around the 1.83 GHz CPU with the 2 MB L2 cache, I'd ignore the entry level model and focus on the remaining two 2.0 GHz models if you're hoping to get any enduring mileage out of this round of MacBooks." "Announced last week, already on store shelves and measuring up well not only to its predecessor but to its big brothers in the MacBook Pro lineup, the new MacBook is an even better value than the model it replaces. With a notable speed boost from the new Core 2 Duo processor, more standard RAM and larger hard drives, the MacBook arrived just ahead of the holiday shopping season. It's as if (insert your holiday icon of choice here) had arrived early. "A prediction: Apple will sell a ton of these, an expectation not at all lost on Apple bigwigs who rushed to tout their new consumer line as soon as it was released. Yes, they readily acknowledged, they wanted to get the updated model out before the holiday shopping season. That makes sense given the upsurge in sales of Apple's laptops this year." "So imagine my surprise when I began to study the results of Macworld Labs' performance tests on the new notebooks: the new $2,499 version of the 15-inch MacBook Pro, with a 2.33 GHz Core 2 Duo processor (Best Current Price: $2449), outpaced its similarly priced predecessor, which had a 2.16 GHz Core Duo chip, by 30 to even 40 percent in tests with very real applications such as Adobe Photoshop CS2 (running on Apple's Rosetta code-translation technology), Compressor, and iTunes. Those results are all the more striking when you consider that our Core Duo comparison system had a 7,200-r.p.m. hard drive, while the new MacBook Pro with Core 2 Duo processor had a stock 5,400-r.p.m. drive." "Al Jazeera International, the English version of leading news broadcaster, Al Jazeera, announced the selection of a wide range of Apple products to deliver a comprehensive, end-to-end solution for the media organization. "Journalists will also greatly benefit from the usage of Apple tools as the Final Cut Studio allows professional editors to elevate production values with powerful editing tools, revolutionary sound design, real-time motion graphics and next generation DVD authoring from the field, while the MacBook Pro is the first Mac notebook built on the Intel Core Duo processor, which delivers the power of two processors on a single chip - for blistering performance with high-end creative applications." PR: QuickerTek announces the Quicky Transceiver that doubles wireless networking for Apple MacBook Pro and MacBooks models. Quicky connects through the MacBook's USB port, eliminating the need to disassemble the computer for installation. Quicky boosts wireless networking distance as well as networking speeds once connected. Quicky is available directly from QuickerTek or from its dealers for a SRP of $225. Quicky temporarily clips to the top of the open MacBook case. 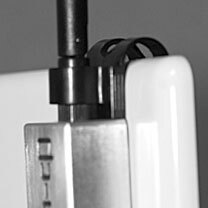 The Quicky is a unique combination of the wireless networking power of the Transceiver and an external antenna that is more effective placed up and out of the confines of the MacBook case. It requires no computer skills to either set up or use and is functionally invisible to the user. Once Quicky is clipped to the case and the short USB cable is connected to the MacBook's USB port, users experience double the wireless networking power. Quicky has 500 milliwatts of RF (wireless) power - that's ten times more than a stock MacBook. This additional RF power means two things: greater operating distances from the AirPort Base Station or wireless access point, and more available networks to choose from. "Quicky is a breakthrough product for us. Customers have asked us to make wireless networking even simpler. The AirPort system is quite good, but there are improvements we've made to give Mac users more flexibility. Quicky is the easiest way to get vastly improved wireless and you don't have to know anything about RF, milliwatts, AirPort or antennas. It's so easy to install and delivers on the promise of ease-of-use that we spend our time trying to build enough of them," stated Rick Estes, president, QuickerTek, Inc.
Quicky works with all 802.11/b/g WiFi equipment from common manufacturers such as Linksys, dLink, Belkin, including Apple AirPort and AirPort Extreme. Since these products are the ones you're most likely to encounter when going mobile, you can expect to be able to connect just about anywhere. Quicky works with all AirPort-equipped MacBook Pro and MacBooks and requires no software drivers or extra steps each time you want to go online. And once online, users will have access to more available wireless networks and connect to any of them at full speeds. Like most QuickerTek products, Quicky is backed with a one-year warranty on parts and labor. As the premier provider of high capacity PowerBook, iBook, and iPod replacement batteries, NewerTech is committed to helping make sure that every used laptop and iPod battery is properly recycled. Elements from Li-Ion batteries can be recycled for use in multiple industries and proper disposal of other components prevents contamination to the environment. NewerTech is devoted to making sure your used notebook and iPod batteries get recycled and that the most convenient means are available for you to do so - including pointing you to the local battery disposal and recycling drop off sites in your immediate area within all 50 U.S. states. Visit Earth911.org for more information. In addition to their commitment to helping you properly recycle your used laptop, NewerTech is dedicated to proactively protecting the environment. Every NuPower laptop battery in production today is manufactured Mercury-free. Further, NewerTech's Intelligent Battery Charger/Conditioners extend the useful life of Apple, NewerTech, or third party laptop batteries, reducing the number of batteries consumers need to discard in the first place. Whenever you purchase a NewerTech battery - whether online or at your local retailer - you'll find that packaging and postage are automatically included for you to ship us your old used battery to ensure proper recycling and disposal. PR: Pell Technology is now using state of the art repair techniques to repair laptops. These methods are saving customers a good amount of money when compared to working with major retailers and manufacturers for these same repairs. The actual method is referred to as component level repair. This involves the technician repairing the different areas of the circuit board. After pre-evaluation, the technicians at Pell Technology will remove the circuit board from the laptop, pinpoint the area that is causing the problem, and then repair that specific area. This is also done with the laptop screen. Although a laptop screen can not be repaired if it is cracked, many times customers have a screen with very faint view or no view at all. A screen with these problems can be removed and repaired. This type of repair is different from the type of repair that major retailers and most computer shops offer in one major way. Most of these retailers will just quote the customer on the replacement cost of these major parts (circuit board and screen). This price is normally about five times the price of component level repair offered by Pell Technology, Inc.
On average a repair of this nature at Pell Technology costs in the neighborhood of $150, where a replacement would run upwards of $700. Major repair depots have been using these methods for years now, but they are not readily available to the public. Pell Technology Inc. is one of the few companies in the US that now offers this service to the American public. Pell Technology has also started working with retailers nationwide, so they can offer their customers this service as well.